On October 29, 2015, Ukrainian president Petro Poroshenko and his Turkmen counterpart Gurbanguly Berdimuhamedow held a historic meeting in Ashgabat. The meeting was a tremendous success, with Poroshenko expressing great optimism that Ukraine’s relationship with Turkmenistan would blossom in the years to come, and that the two countries could cooperate bilaterally across many economic sectors. Turkmenistan’s positive relations with Ukraine, confirmed further by the Ukrainian government’s announcement that Berdimuhamedow would visit Kiev in early 2016, are motivated by two main factors. First, Turkmenistan has ideological solidarity with Ukraine as it regards Russian sovereignty violations in the CIS region as a threat to its own security. Second, Turkmenistan is staking its claim in the Kazakhstan-led movement towards greater economic integration between Ukraine and Central Asia. Turkmenistan can export its energy supplies to Ukraine, in exchange for agricultural and infrastructure cooperation that can help diversify its economy. Turkmenistan’s decision to consolidate its relations with Ukraine in the aftermath of Russian aggression in Donbas is a product of shared concerns about Russian sovereignty violations that have been festering for almost three decades. For most of the Soviet era, Moscow controlled Turkmenistan more firmly than almost any other constituent republic of the USSR. Turkmenistan’s divergence from the Kremlin’s official policies began only in the mid-1980s, when it resisted Gorbachev’s liberal glasnost and perestroika reforms. By 1988-1989, Turkmenistan declared that the Soviet Union’s economic and political policies were exploitative, and its communist leader, Saparmurat Niyazov capitalized on the chaos of the 1991 coup attempt, by calling an independence referendum that won 94 percent of the popular vote. 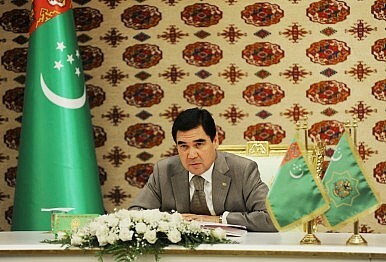 To prevent Turkmenistan’s sovereignty from being violated in the post-Communist era, Niyazov adopted a foreign policy doctrine of permanent neutrality. This neutrality policy often caused Turkmenistan to be sharply critical of the Kremlin. During the 1990s, Turkmen regime officials were extremely concerned that the Russian state media was attempting to destabilize the country by depicting the internal power struggles for succession to Niyazov as a coup. Turkmenistan also emphatically rejected Eurasian integration projects under Russian leadership, and even reached out to the European Union for a trade pact in 2006. The 2008 Russian military intervention in Georgia strained Russia-Turkmenistan relations further, as Turkmenistan feared that Putin could instigate a war to protect 100,000 Turkmens with Russian citizenship. Arkady Dubnov, in his recent article for Carnegie Moscow’s Eurasia Outlook, reported that Turkmenistan staged military exercises on the Caspian Sea’s eastern shores to defend itself and that the Turkmen foreign minister implored the Bush administration to provide a security guarantee against Russian aggression. In keeping with its response to the Georgian crisis, Turkmenistan displayed solidarity with Ukraine in the aftermath of the 2014 Russian annexation of Crimea and military activities in Donbas. Turkmenistan initially blocked media coverage of the Ukraine crisis, due to fears that Maidan could provide a model for popular protest against its highly authoritarian regime. Berdimuhamedow also saw synergy between Russia’s counter-terrorist propaganda in Ukraine and the regime’s desire to contain Islamist forces. But as Russian military activities intensified, Turkmenistan obstructed Russian state media coverage of the Ukraine conflict and pushed for the renegotiation of its dual citizenship laws with Russia. Therefore, the compatibility between Turkmen and Ukrainian sovereignty norms is a crucial driver of the current alliance, even though it is often overlooked relative to the economic factors linking Ukraine to Central Asia. Turkmenistan’s recent pivot towards Ukraine is also driven by the prospect of major economic benefits. Cooperation has extended to a wide variety of economic sectors, with energy, transport and agriculture providing the most lucrative trade relationships. During their meeting on October 29, Poroshenko and Berdimuhamedow agreed to an increase in fuel shipments from Turkmenistan to Ukraine. This represented a major shift in policy, as Ukraine has suspended gas purchases from Turkmenistan in recent years, ending an energy supply partnership that formed during the 1990s. According to the Ukrainian Minister of Energy and Coal Industry Volodymyr Demchyshyn, Turkmenistan has created two major oil refineries capable of shipping 20,000 to 100,000 tons of fuel every month to Ukraine. Even though Ukraine has already agreed to gas deals with Kazakhstan, and with Russian permission, has served as a trade juncture for Kazakh oil entering Eastern Europe, Turkmenistan could be more appealing to Ukrainian policymakers as a trade partner as it is not part of the Russian-led Eurasian Economic Union (EEU). Turkmenistan will be careful not to pivot too far towards Ukraine, because it still regards Russia as a strategic partner. But Ukraine will be tempted to push the boundaries of Turkmen cooperation as far as it can to bolster its attempts at economic diversification. In addition to the energy sphere, the transport sector provides lucrative sources of bilateral trade and investment deals. Turkmenistan has declared its ambition to build transcontinental trade corridors in close proximity to the Caspian Sea, Black Sea basin, North Sea and the Baltics. Berdimuhamedow praised Ukraine’s powerful port infrastructure and strategic geographic location after the October 29 meeting, and expressed considerable optimism that Ukraine would work with the Turkmen regime in achieving its objectives. These port investments would facilitate the flows of natural gas but could also be a gateway to a deeper economic partnership encompassing manufacturing, service industries and recycling. The third sphere of potential cooperation between Ukraine and Turkmenistan is agriculture. The focus of bilateral cooperation in the short-term at least is in agricultural sciences. Five regions of southern Ukraine are in need of irrigation systems to plant wheat. Turkmenistan’s experience with planting wheat in dry conditions has been cited by Ukrainian Minister of Agrarian Policy and Food Oleksiy Pavlenko as a model for Ukraine to follow. The October 29 meeting resulted in a landmark agricultural deal between the two countries that could lead to deeper technology sharing in the years to come. Poroshenko’s recent visit to Ashgabat is a powerful symbol of both Ukraine’s desire to pivot towards Central Asia in order to reduce its economic and energy dependence on Russia; and the CIS region’s tacit disdain for Russia’s aggressive foreign policy towards its neighbors. Should it result in a durable partnership between Ukraine and Turkmenistan, Putin may be forced to reexamine his strategy towards the EEU and Central Asia, to ensure other CIS countries like Belarus and Kazakhstan, remain firmly in Russia’s sphere. Samuel Ramani is an MPhil student at St. Antony’s College, University of Oxford in Russian and East European Studies. He is also a journalist who is a regular contributor to the Huffington Post Politics andWorld Post verticals, and recently to the Kyiv Post.